Garlic is a great herb that will have many benefits. Not only is it delicious when used in many dishes, it also has many different medicinal qualities. Garlic is fairly easy to grow and will be bountiful once it starts producing. The following will help you to grow garlic in your garden. Preparing the soil. Garlic prefers soil that has been heavily amended. 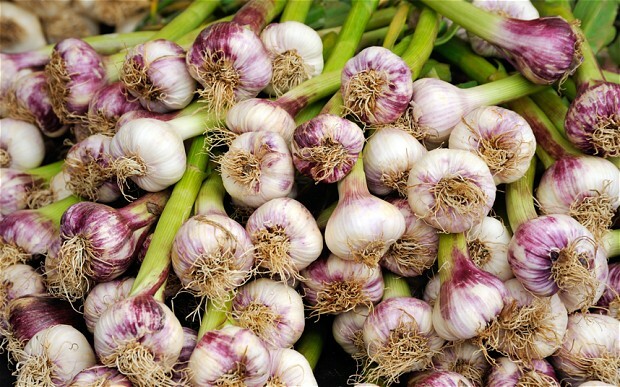 Things like compost and organic matter will make the best for garlic. Garlic does ok in the shade but the plant does best in full sunlight. When you are planting garlic, you will be planting the garlic clove. This clove will then produce its own bulb when it grows. To start your cloves off before planting, place them in a jar with a tablespoon of liquid seaweed and garlic. Let this sit for a couple of hours before planting, and it will help your clove grow better. Garlic is best off being planted in the fall. Cloves should be about 6 to 8 inches apart. Plant the garlic clove in the hole with the flat part down. This is where the roots will come from. Cover with dirt and add mulch of at least 6 inches to the top of the garlic. They will grow for a while before the cold winter months. They will stop growing during the winter months but come spring they will grow again. You will need to leave your mulch on the garlic through spring to make sure that the plant receives the adequate nutrients it needs. Garlic will need to be watered well, especially during the spring months. You will want to make sure that the garlic gets about an inch of water a week. If you are watering, stop watering by June or when the leaves start to turn yellow. This will allow the bulbs to harden. You will see flowery tops that will come to the head of your garlic plant. They will turn into long spiky tendrils. You should take these off to encourage growth. However do not just throw them out. Scapes can make a great addition to any meal. They have a mild garlic flavor that can season up many different dishes. Your garlic should be fertilized at least every two weeks. You can choose a mixture of fish emulsion and liquid seaweed or you can use animal droppings such as rabbit droppings. You can also purchase fertilizer at your local store. Check this video out on growing garlic! In late June and sometimes in early July, the leaves on the garlic plant will start to yellow and brown. When almost all the leaves are yellow or brown, you can harvest your garlic. Remember to harvest carefully as you do not want to damage the garlic bulb. Once you have harvested your garlic, you will want to hang it up to dry. It should be dried for about four to six weeks. When it is dry you will need to trim the roots and store in a mesh bag or other storage container. Do not store near any type of moisture as this will damage the garlic. Other storage options include freezing and dehydrating. Adding garlic to your garden is a great way to get a medicinal food as well as a food that will turn any meal delicious. There are several different varieties of garlic out there, so make sure that you take your time and choose the right garlic for you. Be sure to follow all the tips above and you will have no trouble harvesting the most perfect garlic ever.